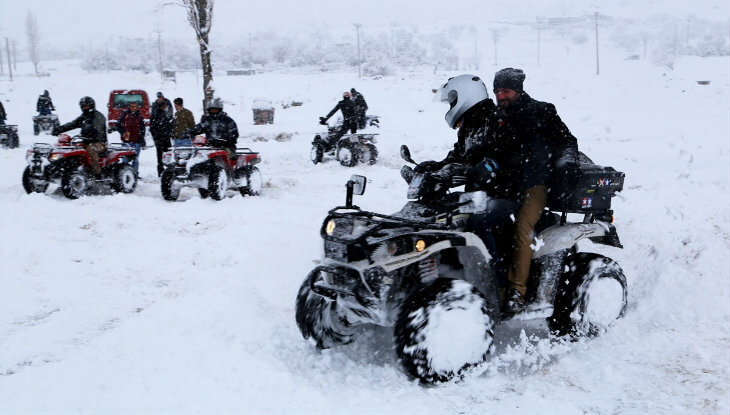 If you wonder about Cappadocia, the creek, the hill; not afraid of dust, sludge, in short; If you love adrenaline, if you love nature ATV quad tour is just for you. Cappadocia has a magical geographic décor where history and nature are intertwined and will make every moment of yours wonderful. One of the best excitements that will reveal the traveler inside you is to ride ATV when you are visiting this extraordinary paradise. If you want to book an ATV tour, you can call the following number, write your request via Whatsapp or send an e-mail. If you do not want to make a reservation, continue reading our website with pleasure. In Cappadocia, there are many companies that rent ATVs and organize ATV tours to see the unique valleys, fairy chimneys and historical beauties. If you love the adrenaline as we say at the beginning, or if you are looking for an alternative to get away from the stressful work pace and get rid of anxiety, you can have a pleasant time with the route drawn by these companies and the guidance service they provide. You don’t need to know how to drive and ride the ATV, which is called a four-wheel motorcycle. Even if you are driving a vehicle for the first time after a short time you can feel confident riding ATV. Designed to go through the desert, sand, snow and asphalt, the ATVs are ideal for nature exploration, where you can ride up to 60 km. The adrenalin part is not hidden in the riding part; your adrenalin will go off the roof when you ride in mud or get soaked as you pass through the water. 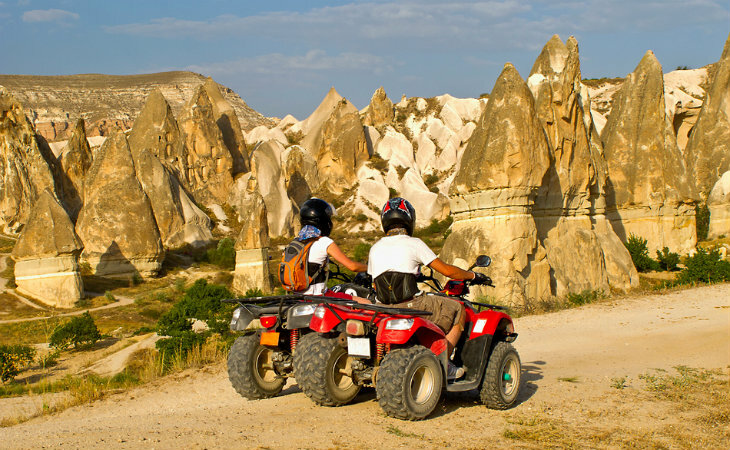 Where and How to Make an ATV Tour in Cappadocia? 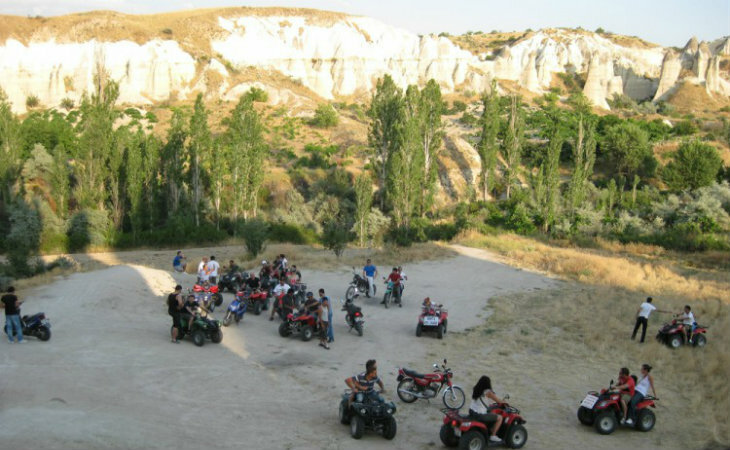 ATV tours in Cappadocia, is made around unique valleys such as Çavuşin Town and Uchisar Castle. You can choose the regions that you want to see in the route alternatives created by the companies renting ATV and you can go to these regions with guidance. Kiliclar Valley, Güllüdere Valley, Kızılçukur Valley, Çavuşin Town, Love Valley, Paşabağ, Uçhisar, Güvercinlik Valley and Devrent Valley are the stops of our route. There are agencies renting ATV 1-4 hours, there are half day and full day alternatives, too. The most popular tour is called the “sunset tour”. You can ride ATVs on your own or with a partner. Some ATV leasing companies do their own tours in the valleys where only an authorized rider can ride them. Before the tour, you are informed about the route and riding info, and then you are going on a short warm-up tour. During the tour, you are asked to wear a helmet and the company provides it for you. Even though the prices are up to the companies, you pay an average of 30 – 40 euores for two hour ATV ride. If you make group reservations, you can get discounts at certain rates. 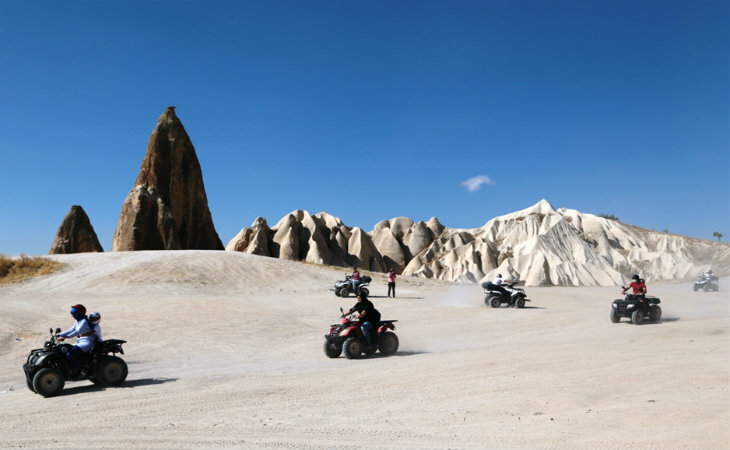 Before and after the ATV safari tours starting from the town of Goreme, the renting company usually provides hotel transfers, guidance and fuel which is included in the price. If you rent a full day ATV, the company pays for lunch and beverages. You may also find some promotions of firms that organize ATV tours on the internet. There are some precautions you need to take when you hire an ATV, even though it is easy to ride and guided. Companies also warn you about these points and legally provide you equipment that you will use for security purposes. You must wear a helmet during the ATV safari tour. It needs to be the full helmet, which covers your chin. Materials such as raincoats and gloves are provided according to weather conditions. It is also important that you wear elbow and knee pads to avoid any injuries in the event of a fall. ATV travelers under the age of 16 can travel as a rear seated passenger. But if they have riding experiences and there is no problem in the warm-up round, they can ride on their own by paying an additional fee. Children under 12 can only ride in the rear seat. Children under 3 cannot participate in the ATV safari tour. In terms of tour safety, you need to have a maximum of 16 ATVs. The engine power of the ATVs is directly proportional to their weight. Lightweight ATVs are much safer when you push on gas and the pressure is not too much. But if you do not have a chance to choose vehicles, try not to over push gas to avoid sudden outflows. Always be careful ! ATV is a machine with motor !